Evanston Public Works Department staff plants a tree Saturday as part of the city’s annual Earth Day celebration. The Evanston Ecology Center also hosted family-friendly activities for the day. 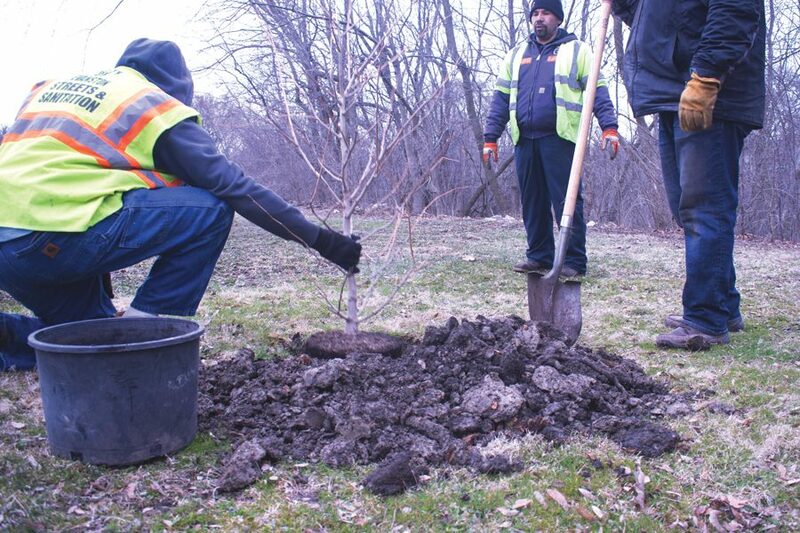 The city hosted an Earth Day and Arbor Day celebration Saturday, designating cleanup spots around Evanston and providing family-friendly activities at the Evanston Ecology Center. The event — “Clean Up, Evanston!” — is the city’s annual Earth Day celebration. The city chose about 10 cleanup spots, though residents could also submit their own neighborhoods or parks as locations to receive support from Evanston, according to a city news release. At the ecology center, 2024 McCormick Blvd., residents participated in seed-planting and nature-play activities. The city and several community organizations including Citizens’ Greener Evanston and the Repair Cafe also provided information about ways residents could live more sustainably. Evanston sustainability coordinator Kumar Jensen said the city picked cleanup areas based on each site’s needs and how many people the site can accommodate. He said some of the organizations that Evanston partners with for the event — including Canal Shores Golf Course and Ridgeville Park District — also hosted cleanups. Jensen said Canal Shores in particular has been “super gung-ho” about participating in the cleanup event and has seen a lot of participation in their chosen locations along the golf course. He added that Canal Shores has many projects it needs done on its property. Saturday’s event was similar to last year’s, but Jensen said some past Evanston Earth Day events only featured one of the three main components Saturday: a cleanup, tree planting or mulching. Paul D’Agostino, Evanston’s environmental services bureau chief, said the celebration has been going on for about seven years. He said it started as a litter cleanup event and recently expanded to include more family-friendly activities and a tree planting ceremony. D’Agostino added that Evanston residents have been engaged with environmental issues lately, as many people applied to serve on Mayor Steve Hagerty’s climate task force.